My husband Stuart Rankin and I founded the Sunrise Cambodia-Six Cat Studios Music Programme in July 2017. We wanted to help children who had no direct path to learning a musical instrument and so sought out violins we could restore and pass on. We exceeded our original intention and ended up creating a music education programme for underprivileged children in another country! We had approached various schools and organisations in Hong Kong, only to be rejected time and again, so when our dear friend Erin Lillis suggested that the children at Sunrise Cambodia could benefit, we were very excited. Erin introduced us to Geraldine Cox, the founder of Sunrise Cambodia, at a fundraiser for the children held here in Hong Kong. Geraldine was rather skeptical that the children would have any interest, yet she allowed us to proceed in setting up a meeting with the school in Siem Reap. 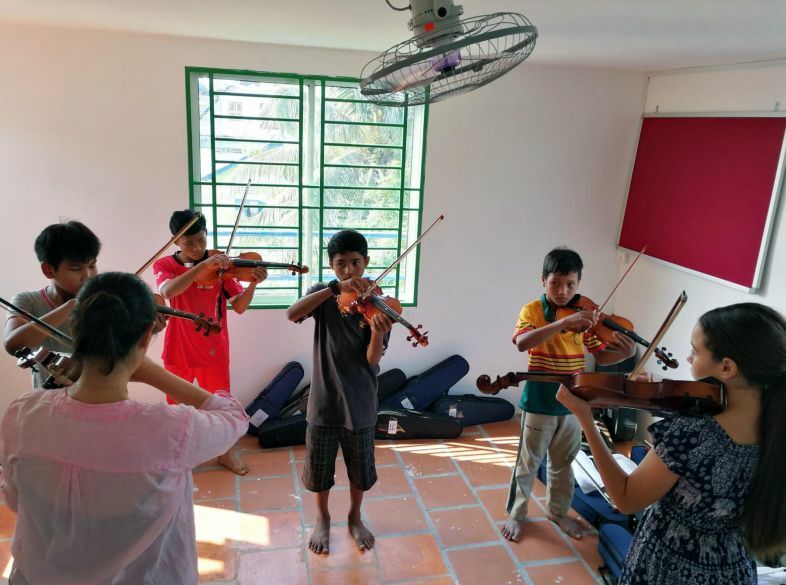 When I arrived in July, I found that the 9 instruments I had carried over were nowhere nearly enough - over 60 children wanted to try the violin. Even the staff at the school and orphanage were interested! I was overwhelmed with happiness at the enthusiasm and openness of the children and I will never forget the smiles and wonder on their faces as they drew their first bows across the strings! By the end of the week, we had 30 or so students who had signed up to continue, and we put in place a schedule for weekly lessons to be delivered via Skype from September onwards. Since September 2017, we have returned twice to Siem Reap – in December for a week and in February for two weeks for intensive daily lessons; and the Skype lessons continue twice weekly. We have grown our violin inventory to 21 instruments and have some wonderful talent emerging! Some of the students receive 1-1 instruction and two of the students have been learning how to maintain and make simple repairs for when I am not there. 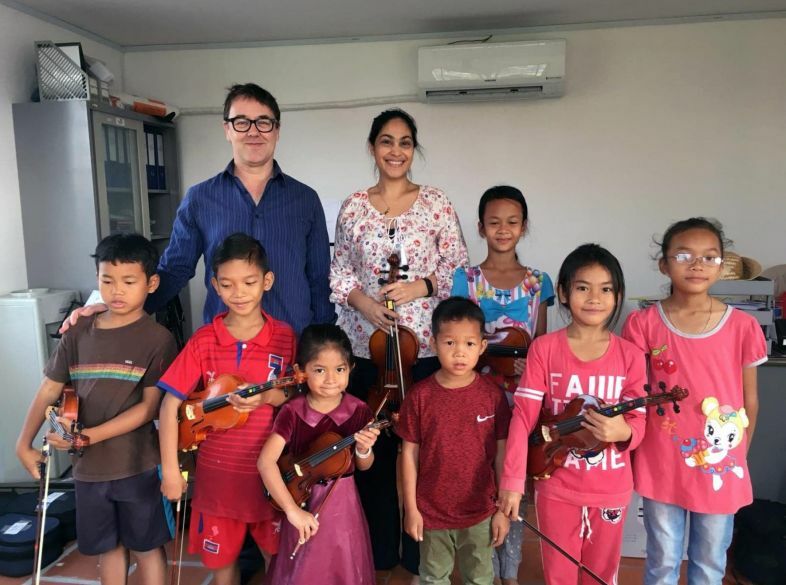 Further to this, we are delighted that our students here in HK have shown great interest in the Programme and have helped to set up and restore violins as part of their volunteer service to others, as well as donating clothes, toys and violins. 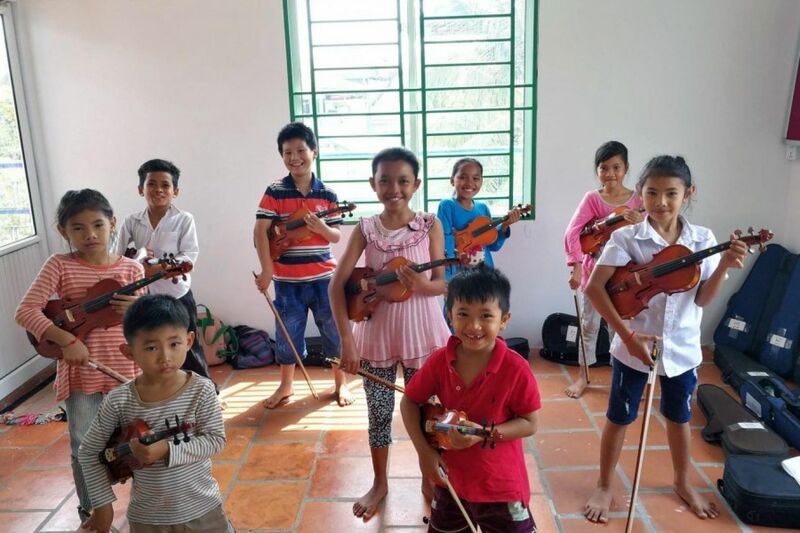 Two of our HK students have had the opportunity to perform, co-teach with me and share time with the children in Siem Reap when they visited with their families. We caught up with Geraldine in Siem Reap this past February and she was amazed and very encouraged by what has been achieved to date. We are working towards expanding the Programme to include more instruments and are very excited for the future! Six Cat Studios accepts all donations of violins, no matter their condition. 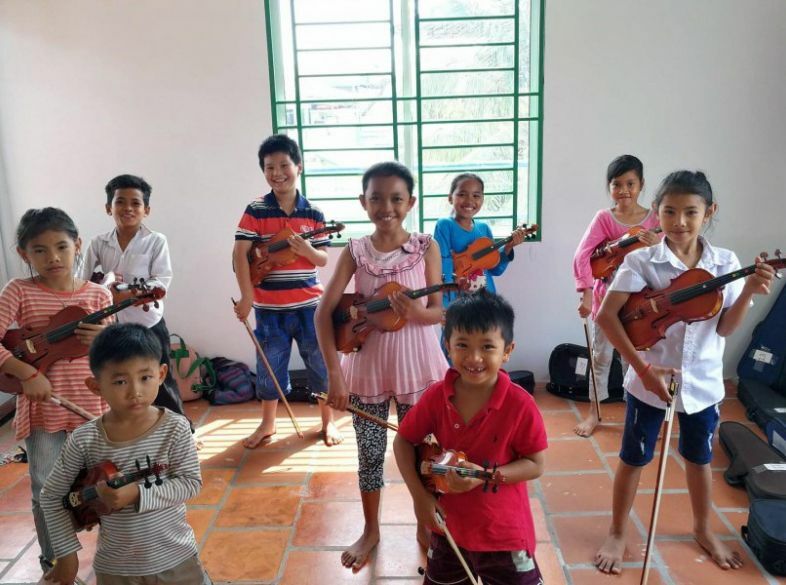 They are particularly in need of 3/4 and 4/4 (full size) violins, bows, spare strings, rosins, music stands and dehumidifying bags for the violin cases. Please email Aniela for more information.